Culture, art and entertainment come together in the one-of-a-kind city of New Orleans. While known for its festivals and celebrations, this Southern playground has more than just Mardi Gras to help you “pass a good time.” In this city, you can gather memories with friends in the streets of the French Quarter, or simply gaze upon its timeless architecture and design. With so many things to do every season of the year, planning a trip to The Big Easy is just that: easy. Check your calendar, view our New Orleans vacation packages and experience the cavalcade of entertainment and attractions that await you. Whether looking to do a pub crawl with your squad or craving an expertly crafted cocktail in an atmospheric bar, New Orleans has the place for you. Stroll down to the French Quarter, known for its litany of bars and festivals including Mardi Gras. 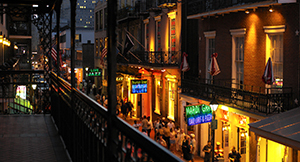 Then enjoy a drink with your friends as you make new ones on the infamous Bourbon Street. The sounds of trumpets and live music will accompany you as you celebrate until sunrise. Downtown New Orleans is the proud home of several districts, all brimming with awe-inspiring views and architecture. The Garden District is one of the most unique areas in downtown and houses everything from celebrity homes to popular shopping boutiques. Residing in the heart of the Garden District is the historic Lafayette Cemetery, famous for being featured in multiple films, works of literature and photographs. Guided tours are available for guests looking to enjoy the gothic design and learn about its famous inhabitants such as The Mayfair Witches and the Vampire Lestat de Lioncourt. If your inner food connoisseur is looking for French cuisine, seafood classics or a little bit of both, New Orleans is calling your name. 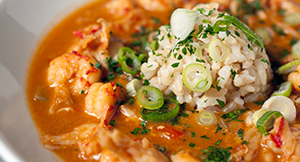 Cajun and Creole culture rule the city and it shows in the food. From signature dishes like jambalaya and blackened redfish to smothered pork chops and crawfish étouffée, the food here will surely make your taste buds flip. Plan your trip around peak crawfish seasons and you’ll find yourself “pinching the tail and sucking the head” like a local. Café Amelie, K-Paul’s Louisiana Kitchen, Bon Ton Café and Mosquito Supper Club are just a few of our favorite restaurants where you can’t go wrong. While in the city, you can listen to your favorite performer at a historic theater or catch a local band in a popular bar. 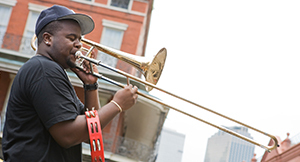 Home to an array of distinct music venues, New Orleans elevates the standard of live music. Sip a cocktail to the sounds of lively jazz at Preservation Hall, dance in the supposedly haunted One Eyed Jacks, or bowl a strike as you listen to rockabilly music at Rock ‘N’ Bowl. Whatever your taste in music might be, New Orleans has the sounds that’ll keep your toes tapping. Traverse the city with ease thanks to the series of streetcars within the downtown area. Four different streetcars run through city, from the French Quarter to the Central Business District. The St. Charles Street Car is the most famous line with its first appearance in 1835. 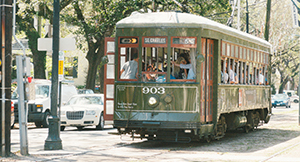 This famous streetcar is a historic landmark that rides through an array of popular sights. Whether you’re taking in the beauty of Crescent City or simply getting from point A to point B, a streetcar allows you to do it in style. Each seat of The Mercedes-Benz Superdome is a different color than the one next to it. With the use of a plastic to-go cup, you can legally enjoy an alcoholic beverage (responsibly, of course) as you walk the streets of New Orleans. 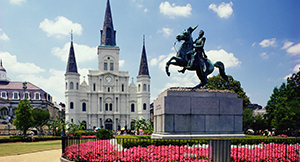 New Orleans is considered the birthplace of jazz as well as the birthplace of famous jazz man, Louis Armstrong. St. Louis Cathedral is the oldest running cathedral in the U.S. The climate of New Orleans varies throughout the year with its average annual temperature being 69°F. February through May hosts cool springtime weather, perfect for the crowds visiting during Mardi Gras. September through January is considered a prime time for most travelers because hurricane season is over and the heat of summer has died down, maintaining a warm comfortable temperature.